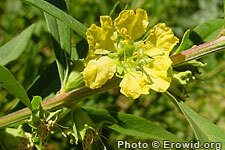 Heimia salicifolia is a perennial shrub with small narrow leaves and yellow flowers growing up to 1.5 meters. It has been identified as the Aztec hallucinogen "sinicuichi" though this fact is controversial. Sinicuichi is reported to be an auditory hallucinogen, but the effects of H. salicifolia are not well known.